What Does Your “Brand” Say About Your Company? When you hear names like Sony, Nike or Gatorade, we know exactly what these products represent. Sony, we think of video products or the iconic yellow Walkman. Nike, we think of running shoes and Gatorade we think of sports drinks. But all these companies have spread their name to other products. Nike now does sporting wear and watches. Sony now does clock radios and cellular phones and Gatorade does nutrient bars. But in a world of cross-promotions and “leveraging your customer base” can a company use their name to perfectly describe their business? I met the owner of SoundsGood roughly 10 years ago, and I could not figure out what got him into this industry. He really didn’t seem like the Car Audio Electronics business owner, he didn’t drive a flashy car, wear a high-end watch or wear name brand clothes, but what was his vision of his company? Keith McCumber comes up to me in sandals, long shorts, and a blue t-shirt with a big white thumb on it and says “Hi, I am Keith”. He was very pleasant and well mannered, but nothing special stood out in my mind. But that’s Keith, the president of SoundsGood Auto in Metro Vancouver. Non-complicated, but he knew exactly how and what kind of business he was trying to build and the experience he wanted to create for his customers. He continued to explain to me, that there are lots of good products out there, but when customers come to him for an upgrade or to add a product to their vehicle, he wants to give them exactly what they want regardless of budget. Keith wants the customer to leave with complete satisfaction or if they have not, create an environment where the customer can be completely honest with him, with their dis-satisfaction and allow them to leave with a resolution. “When we started out with selling and installing mobile audio products, I wanted every customer to simply say “Wow, this SoundsGood!”, says Keith. SoundsGood is more than a company name to him, it is his mission statement. Every vehicle, regardless of budget, sounds the best it can. Since mobile technology has changed so much in the past ten years, so has SoundsGood’s business but not their mission statement. 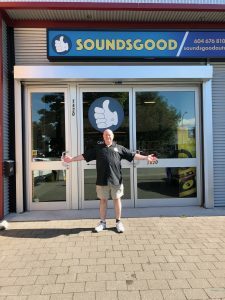 SoundsGood has since opened a second location in Lower Mainland in British Columbia – Canada with the same simple and clear directive. “Every customer that comes in gets exactly what their needs are, or if we cannot provide it within their budget, we turn down the job.” I called him out on this, “You’d rather let the customer walk out and go somewhere else”, Keith looked me right in the eye and said “Yes, we know what we are capable of and what it will cost. If the customer cannot find the funds to make it work, then we cannot perform the job for them. To cut corners is to sabotage our reputation. That is not acceptable”. This was the most honest and passionate answer I have heard from a business owner. But that’s Keith, straightforward, honest and listening to his customers. Going back to the name “SoundsGood”, if the customer listens to his stereo, Keith wants his customers to say, “Wow, this SoundsGood”. If the customer needs a backup camera for safety, and they completely met the customer’s needs in equipment and budget, he wants to hear the customer say “Awesome, that SoundsGood, let’s do it”!